Root-associated beneficial microbes are potential eco-friendly tool and play important role in triggering plant performance against biotic and abiotic stresses. In comparison to chemical-based practices, the fungi such as Trichoderma which are also explored as biocontrol agents are promising and sustainable solution for managing plant diseases. The molecular arsenal of these biocontrol attributes including secretion of volatile and nonvolatile compounds which either alone or in combination with other metabolites is responsible for inhibiting phytopathogens and promoting health of the associated host. Till date, a number of volatile organic compounds (VOCs) of diverse chemical nature have been characterized from Trichoderma spp. 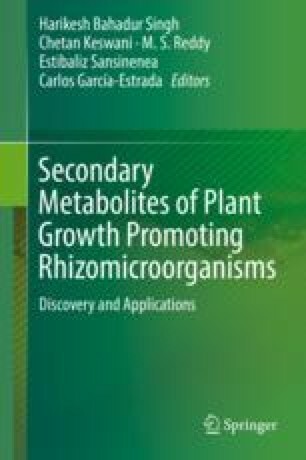 These metabolites of Trichoderma are of vital importance in agricultural, food, and pharmaceutical applications. The VOCs of compounds are known to play diverse functions both in above and underground part of an ecosystem. The widely recognized molecular role of VOCs includes mediators of inter-colony communication, warning signals, pest management, and nutrient acquisitions through root architecture adjustment. The volatile bioactive metabolites such as 6-pentyl-α-pyrone are known to exhibit multiple actions such as inhibiting growth of fungal mycelium, spore germination, and pigmentation of plant pathogenic fungi. Here, an attempt has been made to discuss bioactive volatile metabolites of Trichoderma origin and their role in combating both biotic and abiotic stress responses of host plants. The authors are thankful to SEED Division, Department of Science and Technology, New Delhi, India for providing funding under Scheme for Young Scientists and Technologists (award letter NO-SP/YO/125/2017).